On Sunday, April 22 Dreamland Golf Club played host to the Official Golf Tournament recognising the start of the 2018 Formula 1 Azerbaijan Grand Prix weekend which will be staged on the world class Baku City Circuit. Eighty golfers from Azerbaijan and neighbouring countries participated in this twenty team Golf Tournament. With perfect weather, and course conditions the players enjoyed the very best hospitality from the team at Dreamland Golf Club and Baku City Circuit. Following a relaxing morning breakfast the teams started on course at 10am. The eighteen hole tournament was completed in four hours after which time the players returned for the prize giving gala dinner. The 2018 winners title goes to the team of Alastair Anderson, Susan Drummond, Grant Watson and Ewan Drummond with a gross 67 net 59.9. In second place also with a net 59.9 but loosing on a countback were the team of Lee Henderson, Stephen Chapman, Graham Beattie and Steve Baker after they recorded a 68 gross. The third place team was Alistair Macduff, Andrew Hulston, Nicolas Young and Garry Gaul with a four under par 68 net. The side contest winners for the tournament were - Nearest the Pin Hole 10 Alan Ferguson Nearest the Pin Hole 17 Khalil Huseynov, Longest Drive Hole 9 Susan Drummond Longest Drive Hole 16 Lee Henderson and the fastest recorded ball speed was Mik Triolo – 146.1mph. 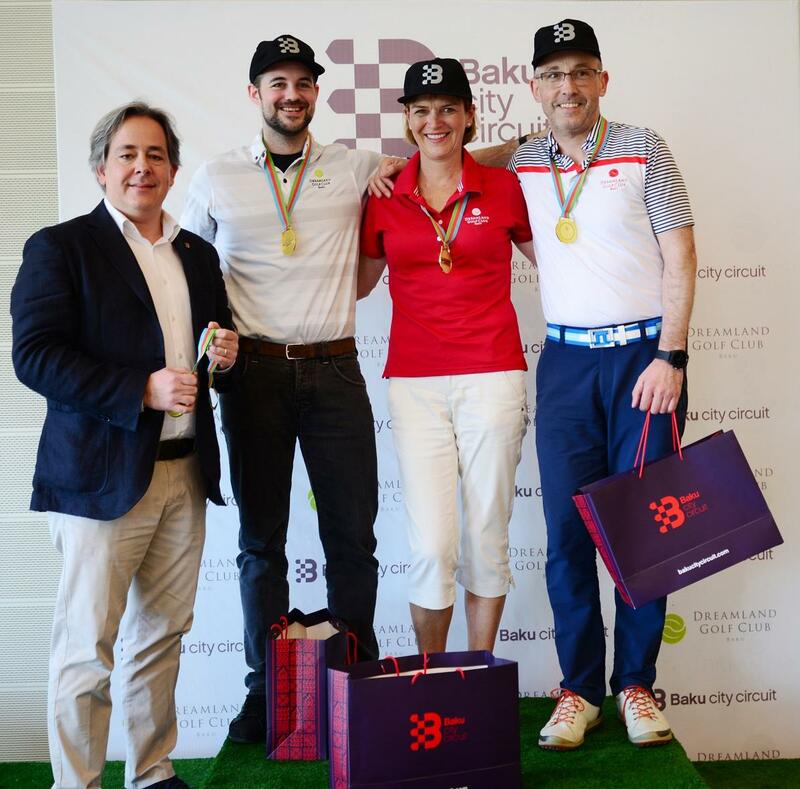 Commenting on the event Bulent Ozerdim Commercial Director for Baku City Circuit, “We are delighted to sponsor this community event for the third year and see so many new faces to the tournament. The feedback from the players has been superb with everyone enjoying the golf course and the hospitality here at Dreamland Golf Club Baku. We look forward to an exciting race on 27th - 29th April on our famous street circuit”. Phil Jones General Manager of Dreamland Golf Club “A huge thank you to the team at Baku City Circuit for their support to the 2018 Baku City Circuit Official Golf Tournament we look forward to welcoming many tourists to Azerbaijan this week and wish the team the very best for an enjoyable Grand Prix weekend”.